San Francisco can be an unforgettable experience for the first time tourist and if you visit these top 9 destinations we recommend seeing on your first trip we guarantee it! ​These top 9 places are a must see in San Francisco and can easily be done in one day with enough time to spend at each destination to enjoy fully. Yes, some of them are very touristy... for example the Golden Gate Bridge or Fisherman's Wharf, but you can not come to this city and miss seeing these top attractions at least once! It would be like going to NYC and not seeing the Empire State Building or going to Sydney in Australia and not seeing the Opera House. And most of the time, tourist attractions are located in the most beautiful part of the city so you will be sure to enjoy where you are even with the crowds. Most of the attractions below are located very near to each other so walking is an option! Otherwise you can purchase a ticket for the Hop On-Hop Off Bus which will take you directly to the places mentioned below along with other destinations such as China Town, Union Square, the Financial District and North Beach. The Golden Gate Bridge is probably the world's most famous suspension bridge and a California icon. It is also San Francisco's biggest attraction and the most photographed structure in this city. It doesn't matter if this is your first time visiting or your fifth, the Golden Gate Bridge is always a beautiful sight to see! The "Painted Ladies" (also known as Postcard Row) is a row of Victorian houses at 710-720 Steiner Street. They were built between 1892-1896 by developer Matthew Kavanaugh who lived in the mansion next door. These particular houses became a well-known San Francisco icon and attraction since appearing in the opening credits of the popular TV sitcom Full House. These pretty houses are situated across the road from Alamo Park from which you can see a spectacular view of the San Francisco city skyline behind. You can briefly stop by for photo opportunities but beware, parking is hard to find. Otherwise, we recommend packing a picnic lunch and spending some time in the park with the locals. The Palace of Fine Arts is located in the Marina District of San Francisco and was originally constructed for the 1915 Panama-Pacific Exposition. Rebuilt in 1965, the building is now listed on the National Register of Historic Places. The building features a classical Roman rotunda with curved colonnades and is a fantastic location for photography lovers. It is situated in an idyllic park where you can see the beautiful architecture reflected in the waters of the lagoon. Vista Point should be high on your list of must see places in San Francisco and was a trip highlight of ours. It is located on the northern side of the Golden Gate Bridge in Marin County and can either be accessed via car heading northbound on US 101 or by taking a short but steep hike up the mountain side. The views from Vista Point are nothing short of spectacular! It is truly worth the effort to get here and marvel over the Golden Gate Bridge from this high up vantage point. Fort Point was built at the height of the Gold Rush period in California between 1853 and 1861 to deter naval attacks in the Bay area. The fort is now a National Historic Site preserved for its outstanding military architecture and it's beautifully arched casemates displaying the art of 3rd system brick masonry. ​Alcatraz is one of the world's most notorious prisons and housed some of America's most ruthless criminals including Al Capone and Machine Gun Kelly. It is now a museum where visitors can hop on a short ferry ride over to the island and take a tour of this once infamous maximum penitentiary. Lombard Street, also known as 'The Crookedest Street in the World' is a street in San Francisco that is famous for it's steep, one block section with eight hairpin turns! Built in 1922, the design was intended to reduce the hill's natural 27% grade which was too steep for most vehicles. Many tourists like to drive down this popular street and tourist attraction and if you would also like to do the same, then be prepared to sit in traffic! Especially on weekends when it gets crazily crowded. 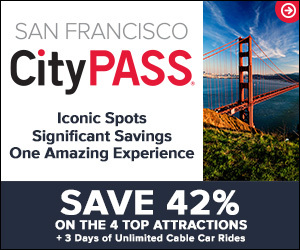 Alternatively, if you will not be renting a vehicle on your trip to San Francisco, you can still visit Lombard Street by catching a cable car (the tram) to the top or bottom of Lombard Street for sightseeing and photo opportunities. Fisherman's Wharf is a neighborhood and popular tourist attraction in San Francisco. It is best known for being the location of Pier 39, the Cannery Shopping Center, Ghirardelli Square, Ripley's Believe It Or Not and the San Francisco Maritime National Historic Park. ​This area is re-known for its delicious seafood restaurants serving up clam chowder bowls and Dungeness crab. Some of the restaurants include Joe's crab shack, Bubba Gump Shrimp Co. and Fisherman's Grotto. Save your appetite! Prefer a guided tour? See our top picks below.